Long before it was envisioned as open source software for hundreds of communities around the world, Mukurtu (MOOK-oo-too) was first created in 2007 by researchers Dr. Kimberly Christen and Craig Dietrich for the Warumungu Aboriginal community in central Australia to be able to circulate, view, and narrate materials following their own cultural practices. Mukurtu, a Warumungu word for ‘dilly bag’– or a safe keeping place for ritual materials, rang true as the name of the platform, as the archive represented a safe keeping place for the Warumungu people to store and share their digital heritage. Sustained through collaborations with the Center for Digital Archaeology, the Association of Tribal, Archives, Libraries and Museums, and Kanopi Studios, eight years later, Mukurtu has grown into a sustainable and scalable software platform that is not only the changing the way indigenous communities store and manage their cultural history, but is also breaking down traditional notions of content management in the technological age. After the initial Warumungu version of Mukurtu got off the ground, Dr. Kimberly Christen began hearing from communities in Canada, New Zealand, and Native American tribes in the United States. With every phone call, the need for a unique response to the challenges faced by indigenous and tribal archives, libraries, and museums (TALMs) became more apparent. In considering existing library and archive content management systems, it became apparent that indigenous communities’ unique cultural needs were not being met. Indeed, Mukurtu researchers found that traditional library catalogs often lacked essential details beyond a short quote or internal tracking number, providing little information to users. Hoping to break down Westernized standards of content management, Mukurtu is designed to allow users to implement their own cultural practices for sharing materials, and to richly narrate those materials. Mukurtu’s “Round Trip” feature, for example, allows users to reach out to institutions and export digital content back into Mukurtu. Users can then richly narrate content for themselves by adding audio, video, and other commentary. Such story-telling features allow communities to reclaim ownership of their digital heritage and connect it with people, cultures, and places. User feedback has always driven direction of Mukurtu’s development, with its features built directly in response to community needs. Recognizing the ubiquity of mobile devices, for example, led to the creation of Mukurtu Mobile. An important strategy to engage younger generations, Mukurtu Mobile had 370 mobile app downloads in 2014 alone. As it spread to communities around the world, the Mukurtu team also saw a clear need for alternative options for hosting the platform. In acknowledging the importance of Mukurtu users maintaining control over their cultural materials, Mukurtu.net was created as a cloud hosted solution. This has enabled communities to overcome the unique challenges posed by infrastructure gaps. By hosting hundreds of virtual and in-person training workshops with communities in the U.S. and around the world, Mukurtu creators educate users about the platform’s core features. These trainings shed light on the difficulty of building one system that works for everyone. To respond to ongoing issues, the Mukurtu team also provides rigorous technical support, completing over 400 individual support requests for its community of users in 2014. Dr. Kimberly Christen realizes that for Mukurtu to be sustainable, they must continue to invest in both outreach and training, as this will ensure that the platform actually meets the needs of the communities it was designed to serve. Mukurtu’s continued progress is rooted in the goal of allowing communities to use and benefit from the platform as they see fit. With hopes for building Mukurtu centers around the country, creators envision spaces for users to someday host their own training workshops. In its relatively short lifespan, Mukurtu continues to expand and evolve. Institutions like the University of Wisconsin now hold trainings. Networks such as the Plateau Peoples’ Web Portal are growing, spanning six tribes in the Plateau Region who share content from national and local museums. These applications hearten and inspire Mukurtu’s creators, who encourage more communities to reclaim their digital heritage and ground its preservation in their own traditions. 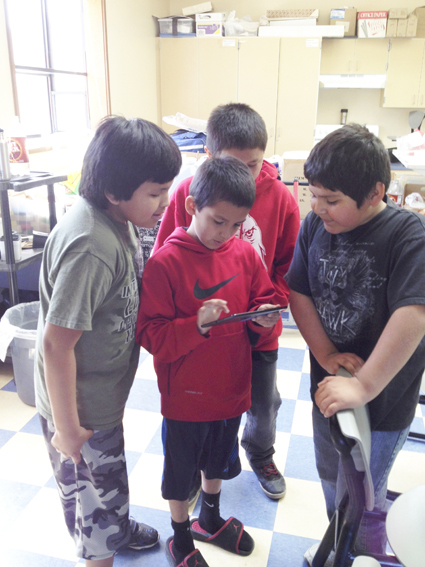 Photo caption: Third through fifth graders use Mukurtu Mobile at Paschal Sherman Indian School in Omak, Washington. Click on image for larger view. Photo caption: Mukurtu infographic containing benchmark data for 2014.